The doctor will ask about your symptoms, physical activity, and how the injury occurred. The injured area will then be examined. Putting the pieces of the bone together. This may require anesthesia and/or surgery. Keeping the pieces together while the bone heals itself. The doctor may give you pain medicine depending upon the level of pain. Your doctor will order more x-rays while the bone heals. The x-rays will help to make sure that the bones have not shifted. When your doctor decides you are ready, start range-of-motion and strength exercises. A physical therapist may help you with these exercises. Do not return to sports until your wrist is fully healed. 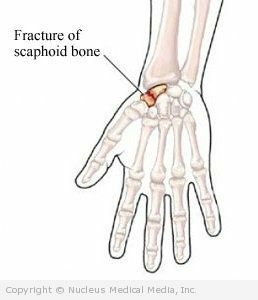 A fracture of a carpal bone may take 10-16 weeks to heal. For the best recovery follow your doctor’s directions. Build strong muscles to prevent falls and stay agile.